Victory Street Party: We Beat the East West Toll Road!!! You are all cordially invited to the Street Party this Saturday, 13th December at 2pm in Fitzroy, corner Westgarth and Brunswick Streets to celebrate a community win on East West Link. Hear Voices from the Picket and sing along with Laura’s anthemic No Tunnel No Way (live). Count the photo petitions on display (and locate yours). You can purchase a set of three beautiful and historical posters created by Tunnel Picket artist (one of them! ), Michelle Baggas Baginskis on the day. Proceeds go towards movie documentary projects afoot. Speakers and music of the Tunnel Picket. See attached. Please share in your networks. 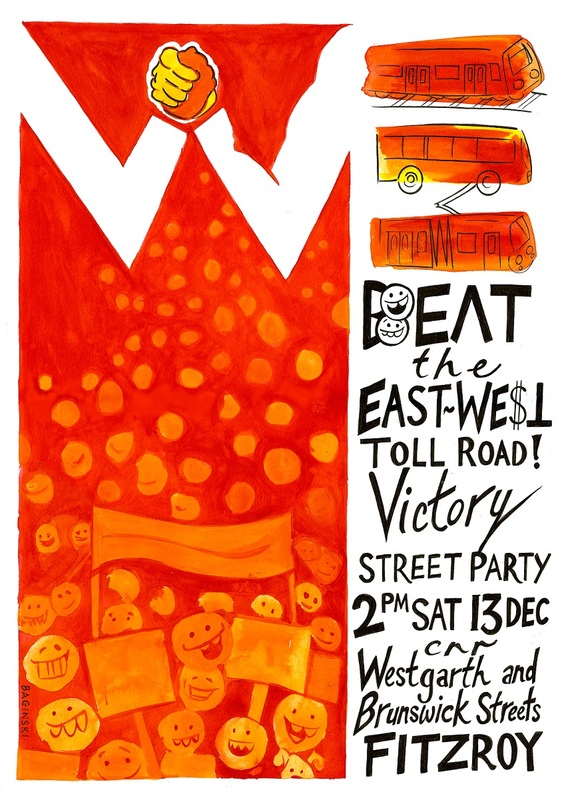 From No East West Link – Take the Pledge: Victory Street Party: We Beat the East West Toll Road!!! Last Friday was the final day for the new Victorian government to submit a case to the Supreme Court to defend the dodgy East West Link contracts. No case has been submitted. We believe this means it is very unlikely the new government will go back in it’s promise to not build the East West Link, at least in near future. The community pressure has been so intense that Labor knows all hell would break loose if it went ahead with the project. What a fantastic victory for the community campaign! For years we fought against this rotten project and now we have prevailed against all odds. It’s amazing what communities can do when we work together and stand up for what’s right. A HUGE CONGRATULATIONS to all who made this possible.